Dry Tortugas National Park is a national park in the United States located in the state of Florida and is composed of a set of seven small islands of coral and sand, located about 70 miles west of Key West, in the Gulf of Mexico. It is one of the most remote and inaccessible national parks of the United States. The first European to discover the area, where the National Park is today, was Ponce de Leon, on his discovery trip in 1513. In the national park, Leon caught 160 sea turtles and when he returned to Europe, he referred to the islands as “Las Tortugas” which means turtles. The name is a mix of English and Spanish. “Dry” ( dry ) is a reference to the lack of fresh water and streams. During the 1600s and 1700s, this area was a pirate base for attacks on numerous merchant ships that sailed the Mexican Gulf, but in 1821, when Florida joined the United States, pirated activities were almost completely eliminated. Explored at the end of 1824 by the American Commodore David Porter, the islands were considered unfit for the construction of a naval base to fight against piracy in the Caribbean. In 1825, however, it was decided to build a lighthouse on Garden Key Island, which was completed the following year. The lighthouse, almost 65 feet high, is made of bricks with a white exterior and is accompanied by a small white house used to accommodate the guard. Even with the added precautions of the lighthouse ships continued to wreck. The lighthouse had a number of issues one being an inadequate light source and the iron door of the lighthouse created blind spots, limiting the visibility for incoming vessels. The lighthouse keeper petitioned Congress for two new lighthouses that would be constructed at each end of the shoals. The idea was to eventually be able to replace the first lighthouse but Congress decided to send inspectors to survey the problems and replace the glass plate with a new one and new lanterns were installed to help increase the efficiency of the current lighthouse but even with the changes there were still a number of problems and continued shipwrecks. Problems continued to plague ships passing the Dry Tortugas and there was a continued increase in navigational issues until a new lighthouse was finally commissioned. Originally named the Dry Tortugas Light, the Loggerhead Lighthouse was outfitted with a modern optical lens and a powerful new reflector that was better equipt to handle warning vessels. The lighthouse was constructed on the more dangerous Loggerhead Key which accounted for most of the shipwrecks in the area. While the lighthouse was completed in 1858 it sustained damage during some particularly severe hurricanes in 1873 and 1875. The lighthouse was transferred under the control of the US Coast Guard after World War II until it became fully automated in 1982 allowing the Coast Guard to leave the islands entirely. The islands of today’s national park became a military reserve in 1845, and in 1846 the construction of a fortress began. The mayor’s buildings were completed in 1850 and the fort was named Fort Jefferson by former US President Thomas Jefferson. The construction of exterior walls of about 45 feet high was completed in 1862. The construction of the fort has continued over the next thirty years but was never completed. During and after the American Civil War, the fort was used as a prison for fugitives and criminals. After a few hurricanes and a yellow fever epidemic, the fort was abandoned in 1874, and the army returned only in 1898 during the Spanish–American War. From 1888 to 1900 was used as a quarantine fortress, and for military purposes, it was briefly used during the First World War. 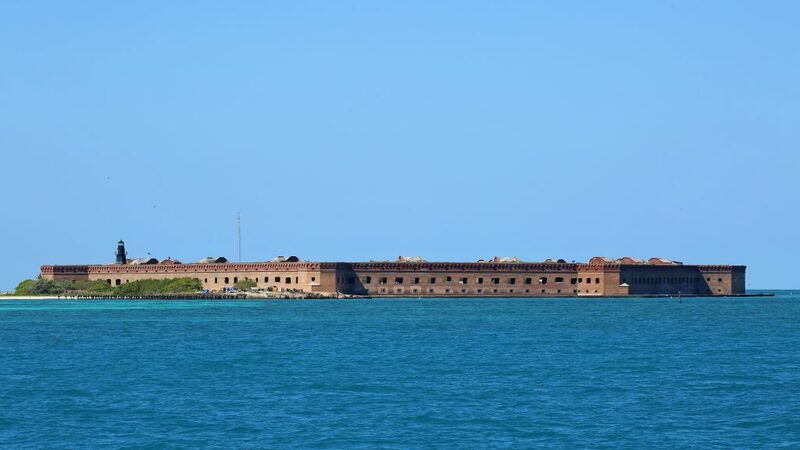 Fort Jefferson was designated a national monument in 1935 under the Antiques Act and the monument was later expanded to redesignate the Dry Tortugas as a National Park on October 26, 1992 under an act of the United States Congress. The Dry Tortugas was established as a reservation to preserve the rich culture and protect the islands and ecosystems. During the federal government’s closure of national parks in 1995, Dry Tortugas was closed with all the other national parks in the United States. 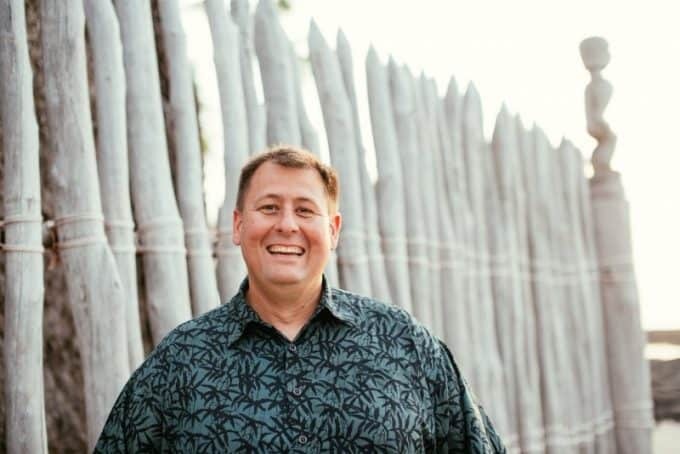 The closure of the national park had a very detrimental impact on tourism and, consequently, the state’s economy, therefore, the state residents who lived near the park began to raise money in order to keep Dry Tortugas open. The park is known for its diverse marine animals, vivid coral reefs, shipwrecks, pirate legends, and sunken treasures. It is a favorite gathering place for people who like touring, picnics in nature, diving, fishing and bird watching. The vegetation of the island corresponds to vegetation in the Caribbean islands. It consists of grass, herbs, low bushes, and mangroves. The park is staffed by the Everglades National park and has seen an increase in tourists since the early 1980s and now has over 80,000 people a year coming to enjoy the snorkeling, camping, fishing, and birdwatching since the islands have an official bird list of 299 species. 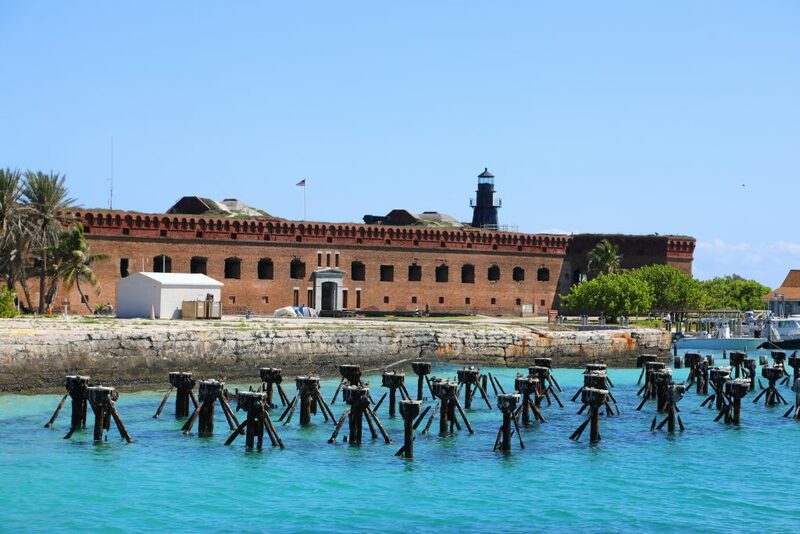 Check out all of the great things to do at Dry Tortugas NP! While visiting the island by private boat due to the difficulties in navigation and distance, most come to visit the Dry Tortugas by official transportation including seaplanes and the Yankee Freedom Ferry. You can camp on Dry Tortugas but it takes some serious pre-planning. Check out this article on Dry Tortugas Camping to learn more about planning your camping trip. We also have a great Dry Tortugas Travel Tips page to help you plan your trip to this beautiful park!